WPP has been named Holding Company of the Year for the sixth year running at the Cannes Lions International Festival of Creativity. Sir Martin Sorrell, founder and CEO of WPP, used the win as an opportunity to say that the company is "as European as ever, and will become even more so" after the UK voted to leave the European Union. The accolade is awarded to the company whose agencies picked up the most points during the festival. Omnicom finished in second place, and Interpublic in third. Ogilvy & Mather, a WPP company, won Network of the Year for the fifth consecutive time. Sister network Y&R came in third place, beaten by Omnicom’s BBDO. Agency of the Year went to AlmapBBDO Sao Paulo, with Grey New York in second place, and INGO Stockholm in third. Droga5 New York won Independent Agency of the Year, with Jung von Matt and Wieden & Kennedy Portland in second and third place, respectively. 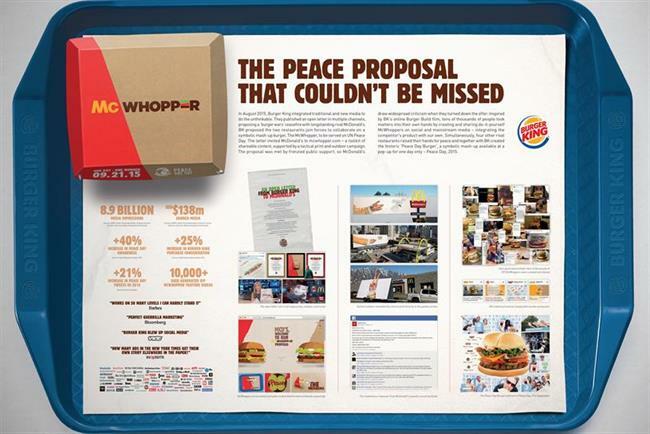 Winning work included Burger King "McWhopper" by Y&R Auckland which picked up two Grand Prix; Under Armour "Rule Yourself — Michael Phelps" by Droga5 New York, which went home with a Film Craft Grand Prix; Edeka "Home for Christmas" by Jung von Matt, which won a Music Grand Prix; and ING "The next Rembrandt" by J Walter Thompson Amsterdam, which landed a Creative Data Lion. "In my cricketing career I have rarely, if ever, hit a six," Sorrell said. "This is the most gratifying one of the few. "Although this award is handed to WPP, it is really testament to the ability, effort and success of the people within our agencies all around the world, and the good judgment of the clients who commission the work. So congratulations and thank you to them. "I would also like to say, for the benefit of our colleagues across Europe, both within and beyond WPP, that although the UK has voted to leave the EU, WPP has not. We are as European as ever, and will become even more so."